Four family members who attacked a 16-year-old boy after discovering he was in a secret relationship with one of their relatives have been jailed. The men, all from Blackburn and of Pakistani heritage, deliberately targeted the boy in a so-called honour attack, Lancashire Police said. The Bengali teenager was forced into a car before being taken to a meeting point in Blackburn and beaten. 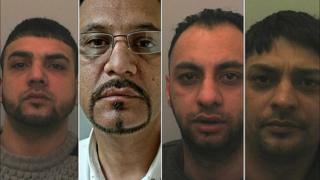 The men were sentenced at Preston Crown Court after admitting several offences. Judge Sara Dodd said she had increased each defendant's sentence by three months because of the racially-aggravated element of the crime. The court heard the "pre-planned" attack was carried out on the evening of 7 March 2016 after the family found out the boy was in a relationship with the girl. Ghazanfar Mirza stopped his car in the middle of East Park Road, Blackburn, where the victim was walking, and persuaded him to get in. He drove at speed before calling the other three men, asking them to bring weapons to the meeting point on Holly Street. The boy was then repeatedly beaten and needed hospital treatment for head injuries. Annabelle Hartley, of the Crown Prosecution Service, said she was in "no doubt" the attack was "motivated by 'so-called honour' and racism". "Although the victim and his girlfriend had been together for some time, they had endeavoured to keep their relationship secret, particularly from their families. "However, when her family found out, they took severe steps." Det Sgt Rachel Higson, of Lancashire Police, said: "There is no honour in attacking a defenceless child, only shame."